Think you need a pile of weights to get in shape? Take a break from your dumbbells and grab some Resistance Bands instead. This portable piece of equipment may be even more effective than a set of dumbbells, because they improves strength and balance. Resistance Bands allow you to work in a full range of motion, so exercises with them target muscles that you can miss with weights. Resistance Bands are elastic bands that are used for strength training and muscle building, as well as for physical therapy. In general, they consist of a rubber band about 10 to 15 inches long. Some come with handles at each end which can be gripped with your hands or placed at the end of your feet, although there are some models without handles. They can be used with familiar exercises but give resistance on contraction and on expansion. Resistance Bands are compact and can be taken anywhere. Resistance Bands are great for mixing up workouts! 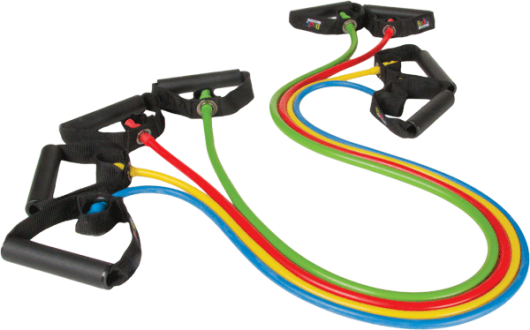 Resistance bands are inexpensive, and can be adapted for a range of strength and experience levels. You can use them with familiar exercises instead of free weights, like bicep curls, or in order to add levels of challenge to weight-free exercises, like sit ups or leg lifts. Resistance bands are compact so you can save on storage space or luggage space if you want to take them to travel. Ultimately, resistance bands are great tools for you to boost stamina, flexibility and your range of motion. There are two main types of resistance bands, and then different levels of resistance for each type. These tubes are generally made of heavy-duty latex rubber and have plastic handles at each end for gripping and hooking for upper and lower body workouts. They are usually available at five different levels of resistance and some include accessories to allow you to hang them on doors and hooks for particular exercises. Tubes generally last longer than bands, as the thicker tubing is more resistant to wear and tear. 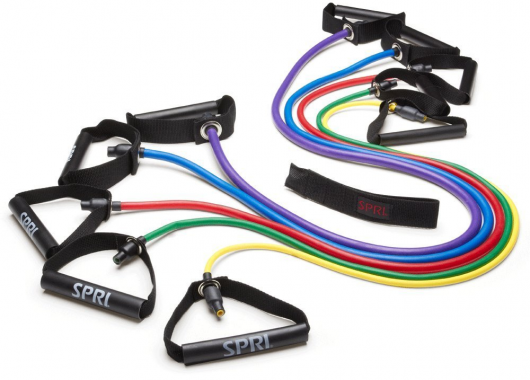 Good quality resistance tubes are the ones from SPRI or the complete kit from Beachbody. 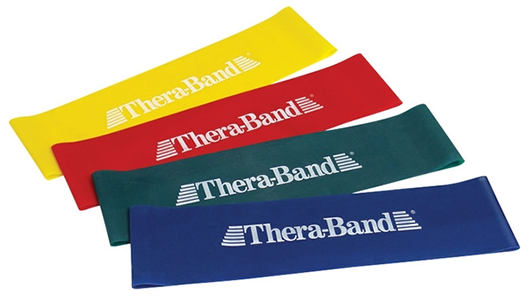 An example of classic flat and thin Resistance Bands are the Thera-Band ones. There are also many cheaper alternatives; see the end of the article for our recommendations. 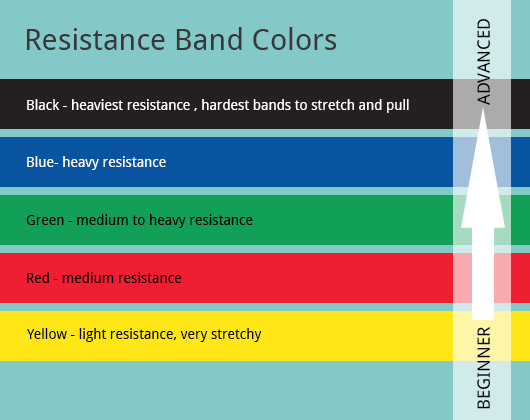 The different colors of Resistance Bands are an indication of it strength and thickness, therefore giving different resistance. Yellow – The yellow bands are classified as light resistance. This means that they are very stretchy, and it takes little effort to pull against them and stretch them out. Light resistance bands are used for working areas such as the shoulders and shins, where you don’t need much resistance to feel the muscle working. Red – Red resistance bands are medium resistance. These bands are less stretchy and have more tension than yellow bands. They have a higher level of tension thanyellow bands and are harder to stretch. Red bands are used for muscle groups that need slightly more tension, such as the biceps or triceps. 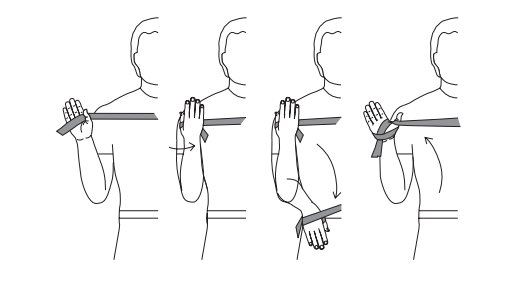 Green – Green resistance bands are medium to heavy resistance. Green bands are suitable for muscle groups that are larger, such as the legs, chest and back, or for individuals who have been building muscle strength. Blue – Blue resistance bands are heavy resistance. These are stiffer than red, green or yellow and do not provide as much stretch. Blue bands are for those who are strong, or for those larger muscle groups, such as the legs, chest and back. These are also the bands to use when working out with someone else. Black – Black resistance bands have the most resistance. These are the hardest bands to stretch and pull. Like blue bands, black bands are used for the large muscle groups, such as the legs, or when working with others. Resistance Bands can be used to add resistance to exercises like squats, bicep curls, and sit ups. They can also be used for a range of more complicated exercises designed to get the most out of the resistance bands with full body exercises. You can stand on the resistance bands for movements to resemble free weights. With all fitness exercises, posture and body alignment is critical. Keep the shoulders and hips aligned, tighten your abs, and relax the knees. Always maintain a natural spinal curve. Always include proper warm-up and cool-down. Perform all exercises in a slow and controlled manner. Control the band rather than allowing it to control you. Be careful to not allow the band to snap back. Avoid over-extending your joints when exercising. Don’t lock the joints. Breathe evenly while performing your exercises. Exhale during the more difficult phase of the repetition. Don’t hold your breath. Perform the exercises without the band until you are comfortable, then add the Resistance Band. Begin with 8 to 10 exercises that target major muscle groups. Exercise with a band that allows you to complete two to three sets of 10 to 15 repetitions with mild fatigue on the last set. Progress to the next level band when you are able to easily complete the three sets of 10 to 15 repetitions. Your Resistance Band should be securely attached to your hand or foot before use to avoid slippage and possible injury. Double wrapping the band may help secure it to your hand or foot. Never exercise with the band unless it is secured properly. Lay the band flat in your hand with the end toward your pinky finger. Wrap the long end of the band around the back of your hand. 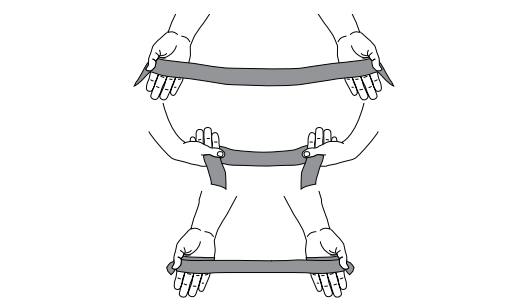 Begin with palms up and ends of band between the thumb and palm. Rotate your palms inward, bringing the band around the back of your hands. Begin with your palm facing forward and the ends of the band between the thumb and palm. Turn your hand downward, bringing the band around the back of your hand. Return the palm facing forward, bringing the band between the thumb and fingers. Stand on the middle of the band. Wrap one end around the top of the foot. Loops can be easily created for upper or lower body exercises. 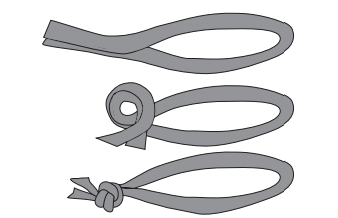 Short length loop: Tie each end into a square knot. 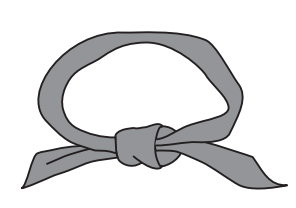 Long length loop: Tie the ends together in a simple knot, leaving a long loop. The two main dangers with Resistance Bands are breaking of the band or letting go of an end while under tension. The result of both these actions can cause the end of the band to snap toward you violently and potentially inflict serious damage. One of the most common injuries is eye damage. Never release a Resistance Band while under tension. A release under tension can cause the band to snap back towards you and result in injury. Begin all exercises slowly to ensure band strength. Always inspect your resistance band before using it. Look for signs of wear and tear, like cracks or holes in the latex and weakness around the handle. Once you see signs of weakness, it is time to throw it out. Make sure the band is secured safely on its anchor when using it. Don’t use door knobs, for example. Never stretch a Resistance Band over 2.5 times their length. Do not store your Resistance Band in moist, hot, or sunlit areas. Resistance Bands are not toys and should never be used for any activity other then the specific exercises they were designed for. We have a separate article with 33 resistance band exercises (including video demonstration). Check out our full-body workout using just Resistance Bands! Here is a short list of Resistance Bands that we have used and can recommend. The truth is that these are low-price items that you can get in most shops with decent quality; a more critical factor is being cautious when training with them so that you don’t lose the grip and they snap back at you! This product set comes complete with four bands of different levels of resistance. They are made of latex and are built to retain their elasticity over many years. A bag for easy storage and travel is included. 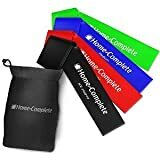 Most reviewers on Amazon are very pleased with these Resistance Bands, and feel they are durable and useful if you are interested in trying loop band exercises. They are low cost, and most users found them to be very cost effective, and many report seeing their legs and hips more toned after using them regularly. Don’t be fooled by the picture – although these resistance tubes are shown all together, all of the tubes are sold individually. They come in five different resistance levels with a different color for each. It is important to note that they also come at different lengths for each level of resistance, getting longer with more resistance. The door attachment is also a great plus, but it doesn’t stay firm with all doors. It has to be a door that closes tight and doesn’t open easily, or it will snap back at you. 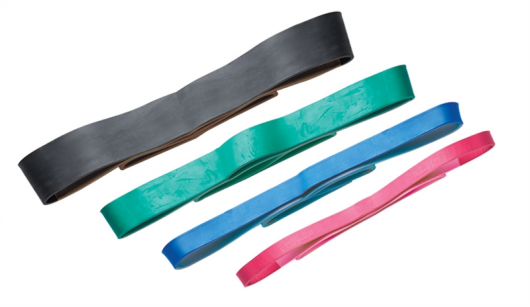 These Thera-Band Resistance Bands are the classic flat and thin bands. They don’t have handles, which is preferred by some users. The pack comes with three different bands (light, medium and heavy), and a basic exercise book. They are the only resistance bands endorsed by the American Physical Therapy Association. These bands do not have a strong Latex smell and are long enough even for taller users. Keep in mind that the product is covered with a slight powder that most users don’t notice. 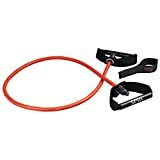 Some reviewers on Amazon were unhappy with the resistance levels, since they are much lighter than tube resistance bands (the highest level – silver – has 8.6 lbs. of resistance.) For this reason this is a good option if you are a beginner, looking to use them to assist with Yoga and Pilates movements or for injury recover. This complete resistance tubes kit from Beachbody comes with 10 bands and 3 sets of handles. It contains the entire range of resistance levels from 5 to 50 pounds. These pro-grade bands can be used with most Beachbody workouts. At $119.95 this is a more expensive option, but if you are looking to get started with a complete kit, this Beachbody deal may be for you.